Click on the photo and see all the photos of Comfortable 2 bedroom modern apartment. Situated in San José, Comfortable 2 bedroom modern apartment features accommodation with a private pool, a balcony and mountain views. The property features city views, plus is 3.2 km from Estadio Nacional de Costa Rica. The apartment includes 2 bedrooms and a kitchen with an oven and a coffee machine. A TV is offered. The property has a fitness centre. An outdoor swimming pool is available for guests at the apartment to use. 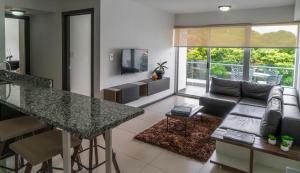 La Sabana Metropolitan Park is 5 km from Comfortable 2 bedroom modern apartment. The nearest airport is Tobías Bolaños International Airport, 2.4 km from the property.